Pork belly is often difficult to come by, but if you can find it, snap it up. For those who don’t know, it’s essentially uncured slab bacon that comes with the skin on the top. With the unctuous fattiness of the meat and the crispy skin on top, it makes a delicious main course. Check with local ranchers to find pork belly, or dig around on the Internet and you’ll be able to find some to order. In this recipe, the spices in the rub and the acidity of the orange, as well as the crunch of the slaw all serve as a delicious counterpoint to the sweet fattiness of the pork. 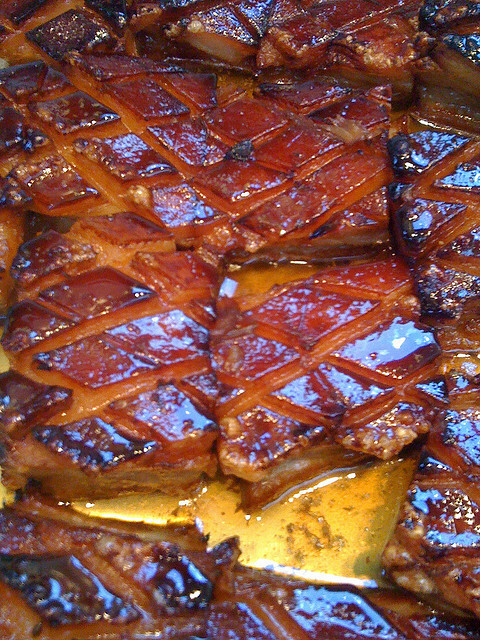 When I made this, it was the first time I cooked pork belly, so I borrowed the crispy skin cooking method from The Clothes Make the Girl blog. Then, I added my own flavors and spices. Trust me, it’s really delicious and rich! Pat the pork belly dry with paper towels. Score the pork skin in a cross-hatch pattern, cutting down to the meat but not through the meat. In a small bowl, mix the paprika, smoked paprika, onion powder, garlic powder, black pepper, coriander, cumin, sea salt, and sweetener. Rub the spice mixture on both sides of the pork. Wrap the pork in plastic and refrigerate for about two hours. Thirty minutes before cooking, put the unwrapped pork belly on a foil-lined baking sheet with the skin-side facing up. Allow it to come to room temperature. Just before putting the pork belly in the oven, rub the skin with the orange juice. Bake the pork belly at 450 for 30 minutes. Reduce the heat to 350 degrees Fahrenheit, and bake for another hour, until the skin has browned and crisped. Rest the pork, tented with foil, for 20 minutes before serving. While the pork rests, prepare the slaw. In a large bowl, combine the jicama, cabbage, onions, and carrots. In a blender, add the avocado, garlic, red pepper flakes, orange juice and zest, apple cider vinegar, cilantro, and pepper. Blend until smooth. Taste and season with salt, starting with about 1/2 teaspoon of salt and continuing to add it until it is properly seasoned. Pour the avocado mixture over the vegetables and toss to coat. Serve the slaw alongside the pork.